The B S PAWAR GRAND Hotel has 20 well-furnished roomsincluding suites. Guests may choose the comfortable elegance of the hotel. Therooms and suites offer a variety of unique features with the preference of theguests as a priority. Our executive suites have the availability for both king-sizeand twin beds with well-furnished and luxuriously designed. The hotel ensures ahomely warmth with comfort and pleasure. Hotel rooms are ideal for gueststraveling on either business or leisure. The tastefully decorated rooms are notonly offer a wide range of services to make your stay as convenient andenjoyable as possible. 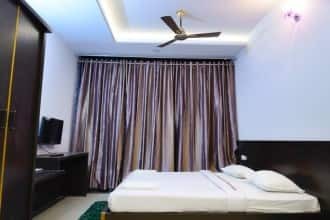 B S PAWAR GRAND Hotel boasts spacious rooms equippedwith a flat screen LCD television, desk, sitting area, coffee and tea facilities,telephone, refrigerator, a safe, spacious bathrooms with separate shower, bath,and blow dryer. All rooms are equipped with WiFi, wireless Internet access, andlaundry and dry cleaning.Car hire can easily be arranged and secure parking isavailable.